Community members are invited to vote for the 2017 recipient. Cazenovia, NY (March 6, 2017)—The nominations are in for the first offering of the Cazenovia Area ‘Entrepreneur of the Year’ award to be given by Cazenovia College with the support and collaboration of the Cazenovia College Alumni Association, the Cazenovia Area Community Development Association, Cazenovia Chamber, Cazenovia Republican, and the Small Business Development Center at OCC. 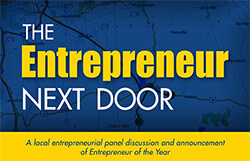 The award will be presented at ‘The Entrepreneur Next Door’ panel discussion and networking event on March 29, which will be on the Cazenovia College campus. Details will be forthcoming but all are encouraged and invited to attend. Voting is now open through Friday, March 17, at this survey link: www.cazenovia.edu/entrepreneur-vote. Kelsey Ball and Sam Bender – Peaks Coffee Co.
Andrea Colella – From The Ground Up Therapeutic Horsemanship, Inc.
Kevin and Kelly McGreevy – Cazenovia Bagel Co.
As you vote, please consider the criteria specified below. This award recognizes the achievements of a Cazenovia Area entrepreneur who best exemplifies the following characteristics and qualities of entrepreneurship: starting and successfully managing one or more businesses; strong entrepreneurial mindset demonstrated through creative approaches, willingness to take risks, engages others, faces ambiguity with enthusiasm, leads others to new achievements; has had an impact on the community, industry, and employees.